1730: born in Ôsaka in the district of Dôtonbori; his name was Izumiya Kyûtarô and his father Izumiya Shôbê managed a shibai jaya. 8th lunar month of 1748: he took the name of Izumiya Shôzô and worked as a sakusha at the Ônishi no Shibai. 11th lunar month of 1748: Shôzô became tatesakusha at the Naka no Shibai, where he worked on the kaomise drama "Fuyugomori Tsumagoi Ikusa", which was produced by Bandô Toyosaburô I. 7th lunar month of 1749: he took the name of Ônishi Shôzô and worked with Takagi Richû on the drama "Otokodate Yôrô no Taki", which was staged at the Naka no Shibai. 11th lunar month of 1749: he took back the name of Izumiya Shôzô and worked at the Ônishi no Shibai on the kaomise drama "Kotobuki Kogane no Kachi Ikusa", which was produced by the zamoto Mimasu Daigorô I, celebrated the shûmei of Murayama Heijûrô V and stared the actors Bandô Toyosaburô I, Arashi Sanjûrô II, Iwai Hanshirô III, Sanjô Namie I, Iwata Somematsu I, Mimasu Daigorô I (the zamoto) and Nakamura Utaemon I. 1751: he became a disciple of the puppet theater playwright Namiki Sôsuke and he received the name of Namiki Shôzô I. 7th day of the 9th lunar month of 1751 : his master Namiki Sôsuke died. 12th lunar month of 1751: premiere in Ôsaka at the Toyotakeza of the puppet play "Ichi-no-Tani Futaba Gunki"; Shôzô was one of the sakusha who worked under the supervision of Namiki Sôsuke to write this drama. 11th lunar month of 1752: Shôzô went back to the Kabuki world, becoming tatesakusha at the Kado no Shibai, where he worked on the kaomise drama "Nagoya Ori Hinatsuru no Nishiki", which starred Fujikawa Heikurô, Sakata Tôjûrô III, Arashi Koroku I, Fujikawa Hachizô I, Mimasu Daigorô I (the zamoto) and Yoshizawa Sakinosuke II. 11th lunar month of 1758: Shôzô was tatesakusha at the Kado no Shibai, where he worked on the kaomise drama "Arigatashi Fujiwara Keizu", which was produced by Nakayama Bunshichi I. 12th lunar month of 1758: premiere at the Kado no Shibai of Shôzô's drama "Sanjukkoku Yobune no Hajimari"; for the very first time in Kabuki history, a mawaributai, invented by Shôzô, was built and used on the stage of a theater [more details]. 1st lunar month of 1764: Shôzô's ni-no-kawari drama "Keisei Hana no Shiroyama" was produced at the Minamigawa no Shibai by Arashi Matsunojô III. 11th lunar month of 1764: Shôzô was tatesakusha at the Kitagawa no Shibai, where he worked on the kaomise drama "Genpei Tsûrikimaru". 9th lunar month of 1767: premiere in Kyôto at the Kitagawa no Shibai of Shôzô's drama "Yadonashi Danshichi Shigure no Karakasa" (casting unknown). 7th lunar month of 1768: Shôzô's drama "Yadonashi Danshichi Shigure no Karakasa" was staged for the first time in Ôsaka, at the Takeda no Shibai, a koshibai venue [casting]. Summer 1769: Shôzô and the actor Arashi Hinasuke I went on tour together in the Awa province on Shikoku island. 6th lunar month of 1770: Shôzô's drama "Yadonashi Danshichi Shigure no Karakasa" was staged for the first time in Ôsaka ôshibai, at the Kado no Shibai [casting]. 1st lunar month of 1771: premiere at the Naka no Shibai of Shôzô's drama "Kuwanaya Tokuzô Irifune Monogatari" [casting]. 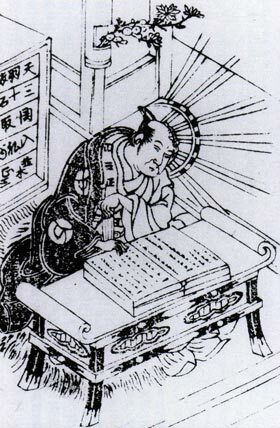 11th lunar month of 1772: Shôzô was tatesakusha at the Naka no Shibai, where he worked on the kaomise drama "Onoe Kikugorô no Baranu Banashi". 2nd lunar month of 1773 : Shôzô's drama "Nippon Daiichi Mekari no Shinji" was staged in the same theater; this was his final creation. 17th day of the 2nd lunar month of 1773: Shôzô died in Ôsaka. Namiki Shôzô I was one of the most notable 18th century Kamigata playwrights. He wrote more than 90 plays and was also as the inventor of the revolving stage mawaributai in 1758. "Namiki Shôzô (1730~1773) was one of the most prominent sakusha in Kyôto, during the middle decades of the eighteenth century. He studied under one of the best ningyô shibai playwrights, Namiki Sôsuke, and wrote for the dolls as well as for the actors. In his time the vogue for the Doll-theatre had already begun to wane, and allured by the superior attractions of Kabuki he wrote more for the latter than for the dolls. His plays were full of complicated situations that tested the actor's ability, a technique he had acquired as a result of his apprenticeship to the ningyô school, which demanded many situations to keep the movements of the marionettes full of significance, for otherwise their dollships would have become all too apparent." The 17th day of the 2nd lunar month of the 2nd year of the An'ei era was the 9th of March 1773 in the western calendar. The 7th day of the 9th lunar month of the 4th year of the Kan'en era was the 25th of October 1751 in the western calendar.